Increasing waiting times and inability to choose your surgeon in the NHS is a common reason to choose private health care through self pay or insurance. The Yorkshire Hip Clinic can see you for a consultation within days and arrange a surgery date to suit you usually within 3 weeks. You have a choice of hospitals for your surgery, to best suit your personal requirements, with consultations available between 8am and 8pm. Our clinic provides a comprehensive specialist hip service covering all aspects of hip complaints across age groups. This includes complex first time hip replacement, replacement of failed hip replacements and sports related hip conditions in those patients who have hip or groin pain with normal x-ray appearances. Joint replacement expertise extends to knee replacement, replacement of failed knee replacements and routine sports related conditions of the knee. Mr Conroy became the first surgeon in England to perform robotic-assisted hip replacement north of London in 2017. 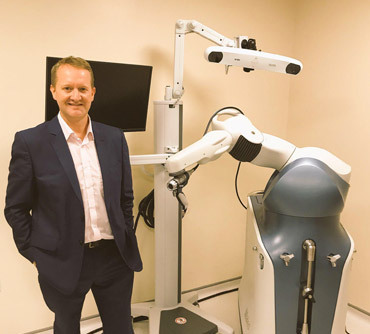 He believes in the use of robotic assistance to aid in consistent and accurate positioning of implants, potentially giving patients a better functional outcome. 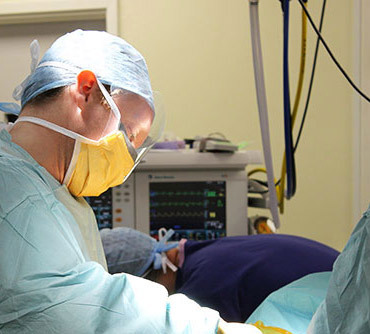 Established as one of the largest Hip Arthroscopy (keyhole surgery) practises in the UK, patients choosing private care from The Yorkshire Hip Clinic enjoy many benefits. The clinic has an interest in sports-related hip injuries and non-arthritic hip / groin pain in young patients. Leading treatments including stem cell therapy are available and you can be sure the latest treatments are considered for you care as Mr Conroy lectures internationally on hip related conditions. National data is collected on joint replacements. Mr Conroy’s data is included here. It shows he performs large numbers of hip and knee replacements compared to the national average including revision or second time replacement for failed joints. Outcomes shown give you the reassurance you have chosen a surgeon with extensive experience and excellent outcomes. Click here for - National Joint Registry Surgeon Profile.